One of the biggest mistakes that I see in most CCW training is the assumption that it will happen in either open space, either interior or exterior. We train to fight in our living rooms, the parking lot of our offices, and similar spaces. We assume that—cover/concealment aside—we’ll have open line of both incoming and outgoing fire. And finally, for safety reasons, we train wearing eye and ear protection. In reality, self-defense CCW shootings will happen in the time and place of the bad guy’s choosing, and the way we train may not reflect those conditions. A great many self-defense shootings involve a vehicle. Maybe you’re in one, maybe you’re ambushed by one, but those rolling boxes of glass and steel often come into play. For purposes of this discussion, we’ll assume for the most part that you’re the one in the car. As it turns out, that assumption changes everything about how CCW shootings happen. Practice with your current setup until you can draw and present while seated-and-belted. Adjust your carry rig so that you can store the gun in a more accessible place while in the vehicle. Just take your chances and hope nothing goes wrong. I do not recommend that last approach. The first option—practice with your current rig—is likely going to be the most popular, and that’s not a bad thing. These are skills you’ll need anyway: drawing and presenting from a shooting position, weapons presentation and retention with a confined space, and extricating yourself quickly from a self-defense shooting. 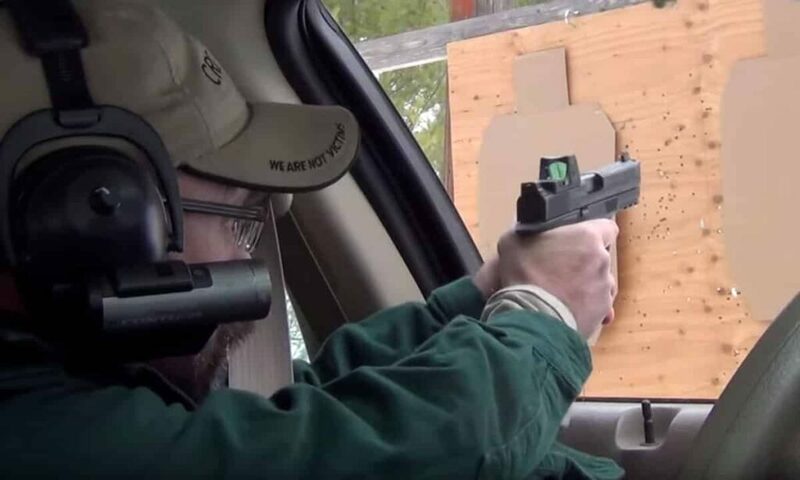 Each will have it’s own considerations, but in all of them you may find yourself shooting from a less than ideal position: close weapons retention index shooting on your side of the car, one arm outstretched for the opposite side. These are different than the sights-oriented Weaver-style stances most of us train on, so get in your vehicle and practice, practice, practice for that contingency. Protip: practice in a garage or other out-of-sight location. If your neighbors see you waving a gun around in your car you may spend a long day talking to law enforcement. There’s another important thing to consider: most of the time the windows are up in the car—the windshield certainly is. If you draw and engage a threat from within a vehicle, you may be shooting through glass. Automotive glass is tough, tough stuff, and as our friends at The Box O’ Truth have shown, it has a significant effect on the ballistics of a shot. The Box O’ Truth concludes, and I agree: “A car is a much better weapon than a handgun” and using it to flee the scene is likely your best option—if it is an option. However, if you must shoot from within the vehicle, you’ll also be contending with the unbelievably loud noise of a gunshot in a very small space—you’re likely to damage your hearing, or even stun yourself if you’re not prepared. While car glass doesn’t break into dangerously sharp shards, it does kick up a fair amount of dust when broke, so you’ll probably have irritated or temporarily impaired eyes. All of this will affect your performance during and after the event, so bear that in mind. There’s a lot more to talk about, including the legal implications of a vehicle-involved shooting. I hope the information here was helpful to you, and if you’ve trained or taught shooting from a vehicle I encourage you to share your knowledge in the comments section. I’m sure many of us could benefit from your experience. Previous articleLasers on Concealed Carry Weapons – Do You Need Them?